Henry Balchen was the brother of Richard Balchen and thus the uncle of Mary Balchen who married John Man. Henry next married Mary Scott on 23 April 1745 St. Mary, Rotherhithe, Surrey. They had one son – John Balchen. He was born in 1745/46 and baptized on 7 March 1745/46 at St. Mary, Whitechapel. Mary (Scott) Balchen died sometime before 1763. Henry next married Mary Matthews on 1 September 1763 at Saint Dionis, Backchurch. They do not appear to have had issue. 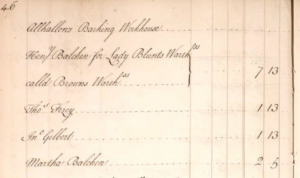 Mary (Matthews) Balchen died on 1 January 1778 of the ‘palsy’ and was buried on the second of that month at St. Mary, Whitechapel. Henry wrote his will in 1777 and it was proved on 12 April 1780. A transcription of the will can be found at the end of this page; the original can be viewed HERE. 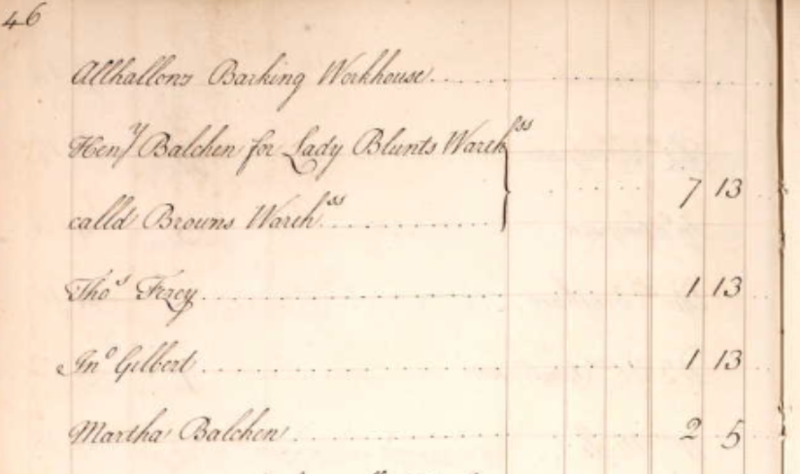 At some point in the 1760’s John Man had been appointed as one of trustee to moneys held on behalf of George and Richard Cumberland, his wife’s nephews; the other trustee was Henry Balchen. Some ten years later John left England for Wales and his whereabouts became unknown. As a result it was necessary to arrange the release of the trust money without John. But this was not easy and a legal tussle between the Cumberland family and the remaining trustee – Henry Balchen – to have the trust funds released took place. The legal arguments used to bring this about can be read HERE. 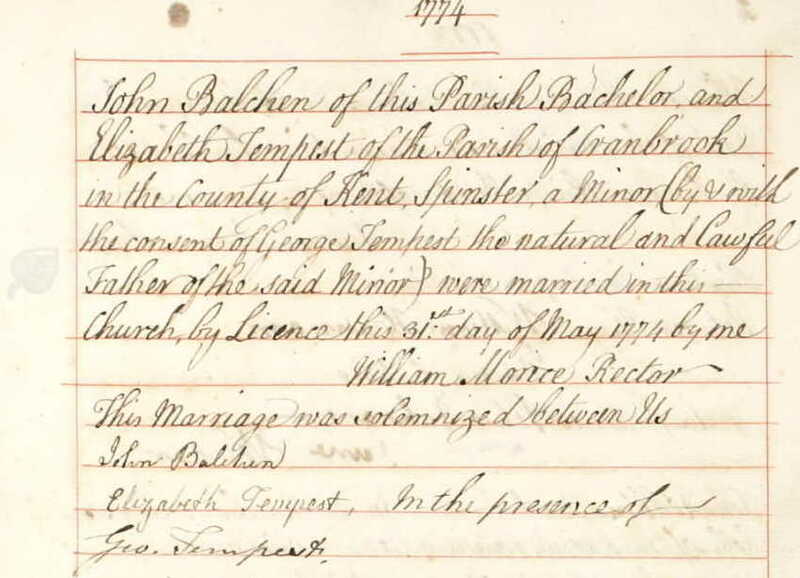 John, the son of Henry and Mary (Scott) Balchen, married Elizabeth Tempest on 30 May 1774 at All Hallows, Bread Street, London. Elizabeth was the daughter of George and Elizabeth (Morris) Tempest of Cranbrook in Kent. She was born in 1756 and died on 31 July 1778 aged 22 and was buried at St. Giles, Bodiam in Kent. John died on 9 January 1785 aged 38 in Milk Street, London. 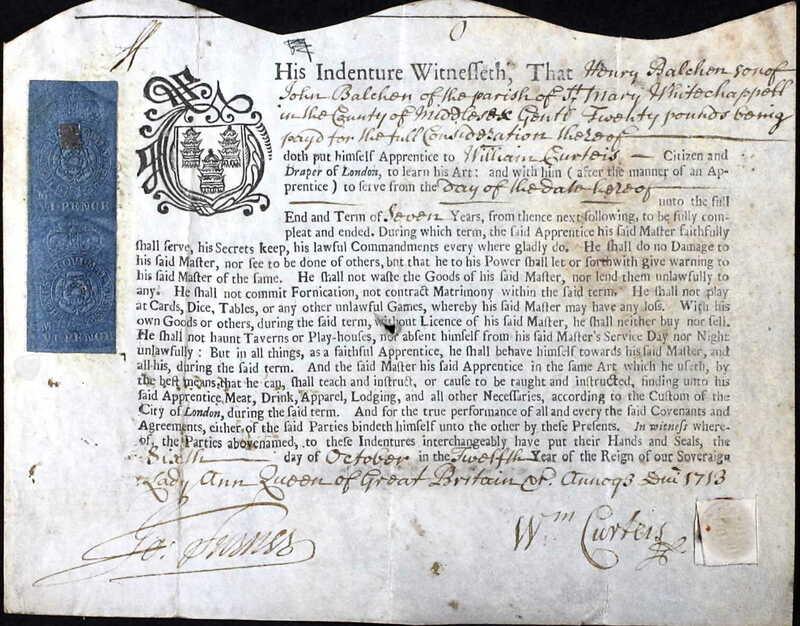 On 29 July 1761 John was apprenticed to William Tapp, his father’s business partner. John was buried at Bodiam in Kent. He left a will which can be read HERE. At St. Giles church Bodiam on the south wall there is a mural monument for John and Elizabeth (Tempest) Balchen. 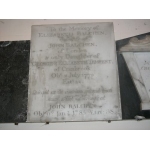 This rather poor image of the Balchen’s memorial is from the Sussex Records Society web site. It measures 57(W) x 66.5(H) and consists of 12 lines + 2 lines, engraved and black, English and Latin fills an unframed white marble tablet. 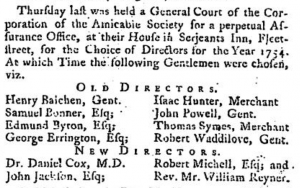 According to Boyd’s Inhabitants of London John Balchen was Clerk to the Secretary of the New River Company. 1. Elizabeth Balchen. She was born on 7 April 1777 and was baptized on 5 May 1777 in St . Lawrence, Jewery. Elizabeth died in May 1778 and was interred on the eleventh of that month in the Little Vault at St. Lawrence, Jewry. 2. Mary Ann Balchen. She was born on 30 April 1778 and baptized on 27 May 1778 at St . Lawrence, Jewry. Mary Ann died in July 1849 in Brighton. Nov. 5. At Bournemouth, aged 83, the Rev. Thomas Causton, D.D. the senior Prebendary of Westminster, and Rector of Turweston, Bucks. He was formerly of St. John’s college. Cambridge, B.A. 1791, M.A. 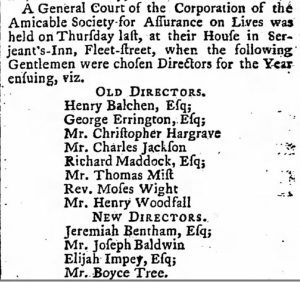 1794, D.D. 1820; was appointed a Prebendary of Westminster in 1799; and presented to the rectory of Turweston in 1826 by the Dean and Chapter. Thomas Causton DD. Admitted St John’s College Cambridge 12 Apr 1787. 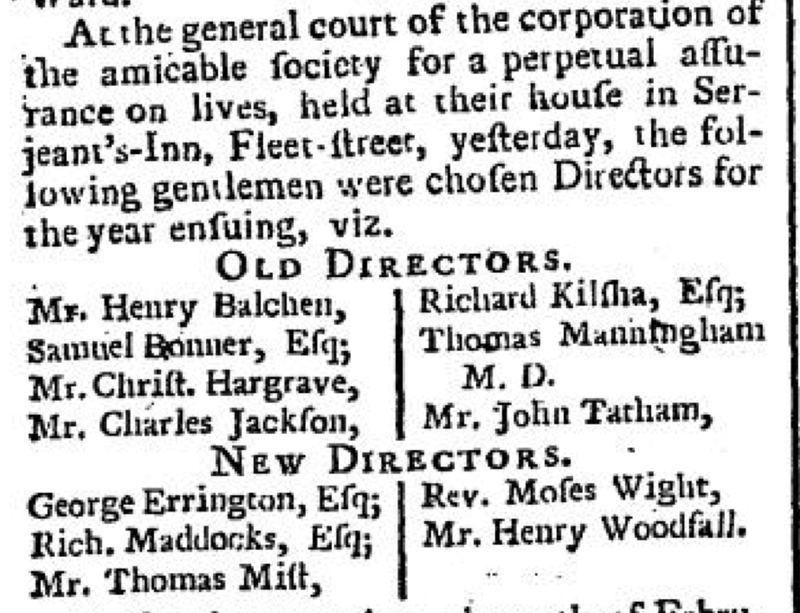 First day of residence 19 Oct 1787. Admitted Robinson Scholar 6 Nov 1787 (he then gives Middlesex not Essex as his place of birth) BA 1791, MA 1794, DD 1820. Ordained deacon 18 Dec 1791 by bishop of Lichfield & Coventry, with letters dimissory from Bishop of Norwich. On 15 Mar 1792 bishop of Salisbury granted him letters dimissory to be ordained priest by bishop of Bristol. Prebendary of Westminster 26 Mar 1799. Vicar of Turweston Bucks on presentation of Dean & Chapter of Westminster 1826. 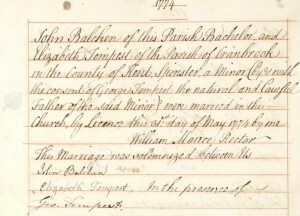 Held post posts till he died 5 Nov 1842 at Bournemouth, aged 83 (GM 1843 i 103b) Married 1 June 1799 Miss Balchen dau of late John Balchen Esq. (b. 1799, 1188a). His widow Mary Ann died in 1849 at Kemp Town Brighton (ib. 1849 ii 109a). From Admission to St Johns College Cambridge. The Causton Memorial, founded by deed, 12 June 1850. A sum of £102 13s. 11d. consols was raised to perpetuate the memory of the Rev. Thomas Causton, D.D., Prebendary of Westminster, for many years rector of the parish. The sum of stock is held by the official trustees, and the annual dividends amounting to £2 11s. 4d. are applied in the distribution of winter clothing. Transcription of the Will of Henry Balchen, 1777. 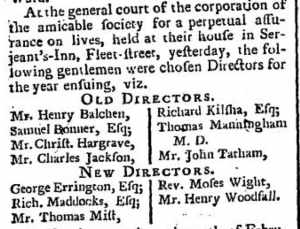 I Henry Balchen of Goodmans ffields in the Parish of St Mary Whitechapel in the County of Middlesex, Gentleman, being of sound and disposing Mind, Memory and Understanding, praised be Almighty God, do for avoiding controversies after my decease make public and declare this my last Will and Testament in manner and form following, that is to say, ffirst and principally my Soul I recommend into the Hands of Almighty God, my Creator listing for pardon and remission of all my Sins by and through Him alone merits and mediation of my Lord and Saviour Jesus Christ. My Body I commit to the Earth to be devoutly interred in the middle Isle of the Parish Church of St Mary White Chapel aforesaid as near my Relations as conveniently may be and I desire and direct that my Burial and ffuneral Expenses shall not exceed thirty pounds. I will and appoint that all my just Debts and ffuneral Charges shall be fully paid and satisfied. I give and bequeath unto my dear and loving Wife Mary Balchen and her Assignes my Leasehold Messuages or Tenements wherein I now dwell situate in Mansel Street in Goodmans ffields aforesaid for so many years of the ….. in the Lease thereof under which I hold the same as she shall happen to live subject nevertheless to the payment of the Rent and performance of the ….. in the said Lease and from and after her decease I give and bequeath the said Leasehold Messuages and Tenament unto my Son John Balchen, his Executors, Administrators and Assignes for the remainder of the term of Years which shall be then to … therein. I give to my said Wife all my Household ffurniture, plate ————– Towels, , Rings, China, Linen, Pictures, Liquors and all other household Stores. I give and bequeath unto the Trustees in the Settlement made previous to my Marriage all that my Leasehold ffarm with the Lands and Appurtances thereto belonging situate at Grays Hill in the Parish of Roresterleigh in the County of Gloucester now in the tenure or occupation of Daniel Luton or his undertenants to, for and upon such of the Trusts expressed in my said Settlement concerning the said Estate as at the time of my decease shall be existing and capable of taking effect. I give and bequeath unto John Scott of Cranbrook in the County of Kent, Esquire, and to my Son John Balchen twenty Guineas each for their trouble in executing the trusts of this my Will and to each of them a Ring of one Guinea value. I give unto Richard Cross of Richmond in the County of Surrey, Esquire, a Ring of two Guineas value. I give and bequeath to my Niece MaryMann and to her four children Ann, ffrances, Anna Maria and James ten pounds each to be paid to them within one Month after my decease. I give and bequeath all the rest, residue and remainder of my Estate unto the said John Scott and my said Son and to the Survivor of them and to the Executors and Administrators of such Survivor upon Trust that they do will all convenient speed lay out and invest the same in some of the public ffunds or other Government Securities and that out of the Dividends and produce thereof they do pay unto my said Niece Mary Mann and her Assignes for her natural life one Annuity or — Yearly Sum of twenty pounds of lawful Money of Great Britain by four equal quarterly payments on the four usual Days of Payment in the Year (that is to say) the twenty fifth day of March, the twenty fourth day of June, the twenty ninth day of September and the twenty fifth day of December, the first payment thereof to be made on such of the said Days as shall first and next happen after my decease to and for her own sole use and benefit and I direct that the said Annuity shall not in any wise be subject to the Debts, –. or engagements of her present or any future Husband. But that the Receipts of my said Niece Mary Mann notwithstanding her coverture shall be good and sufficient discharges for all such Sum or Sums of Money as shall be paid to her on account thereof and that they do pay the residue of such Dividends and Produce unto my said Wife and her Assigns during her natural life and from and after the decease of my said Wife and subject to the said Annuity to my said Niece I give and bequeath the residue of my said Estate and the ffunds and Securities —.. the same shall be invested unto my said Son John Balchen, his Executors and Administrators and I constitute and appoint the said John Scott and my said Son John Balchen Executors of this my last Will and Testament and lastly I do hereby revoke and make void all former and other Wills by me heretofore made and do publish and declare this only to be my last Will and Testament. In witness whereof I have hereunto set my Hand and Seal this eighteenth day of ffebruary in the year of our Lord one thousand and seven hundred and seventy seven. Hen Balchen @ Signed, Sealed, Published and Declared by the said Henry Balchen as and for his last Will and Testament in the presence of us who at his request and in his presence have hereunto subscribed our names. Joseph Baldwin — Owsley Rowley his Clk. And it is my further request that my Executors named in my above Will pay to ffrances Mann forty pounds over and above the ten pounds left her in my Will and Also to Ann ?arrot eight Guineas if she shall live with me at the time of my death. Nov’r 30 1778. H. Balchen./. This Will was proved at London with a Codicil the twelfth day of April in the Year of our Lord one thousand seven hundred and eighty before the Worshipful Andrew Coltee Duraarel, Surrogate of the Right Worshipful Peter Calvert, also Doctor of Laws, Master Keeper or Commissary of the Prerogative Court of Canterbury, lawfully constituted by the Oath of John Balchen the Son of the Deceased and one of the Executors named in the said Will to whom Administration was granted of all and singular the Goods, Chattels and Credits of the said Deceased having been first sworn only to Administer. Power reserved of making the like.